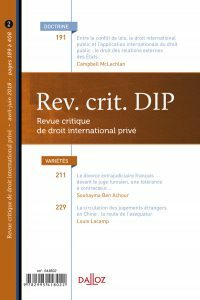 The last issue of the Revue critique de droit international privé will shortly be released. It contains several casenotes and an article, authored by Campbell McLachlan who is Professor of Law at Victoria University of Wellington (“Entre le conflit de lois, le droit international public et l’application internationale du droit public : le droit des relations externes des Etats »). The relationships between States and individuals of foreign nationality from the perspective of their constitutional rights and freedoms raise a series of issues that all States must resolve and that sit at the interface of the constitutional order of each of them and the intertional legal system through which they are connected. Today, this interface has progressively become porous, raising legal problems in increasing numbers and with increased frequency. The various responses generated thereby exercise a powerful influence over the legal imaginary, including on the ways in which a legal system represents its own relationship with the rest of the world. The thesis developed here is that such responses belong to a third discipline, in between the two traditional, public and private, branches of international law. This discipline can be called « the law of external relations », borrowing a term from one of the Restatements of the United States but little used in Europe. In what follows, the possible conceptions of this disciplinary field will be explored, along with its relationship to private international law.